Does the Gerstein Report contain so many impossibilities that it cannot be accepted as evidence? The Gerstein Report is filled with so many “absurdities and “contradictions” that it must be dismissed as evidence for the existence of gas chambers at the Operation Reinhard death camps of Treblinka and Belzec. For example, Carlo Mattogno, an Italian Holocaust denier, claims that he has found 103 internal and external contradictions, falsifications, errors of fact, exaggerations, and unrealistic statements in Gerstein’s report, making the whole account untrustworthy. The Gerstein Report is not perfect. Gerstein erred when describing the gas chamber rooms, the number of Jews murdered in the Operation Reinhard camps, and when estimating the amount of the stolen possessions of murdered Jews. Some of his errors came from depending on the word of others. However, Gerstein’s testimony is consistent about the process and method of mass murder at the death camps of Treblinka and Belzec. Between drafts, Gerstein changed the dimensions of the gas chamber rooms in Belzec. Gerstein said there were more gas chamber rooms (8) in Treblinka than existed (3) at the time he said he observed the mass gassing. The gas chamber rooms, as described by Gerstein, were too small to hold the 700 to 800 people that he claimed the Nazis pushed into each room. 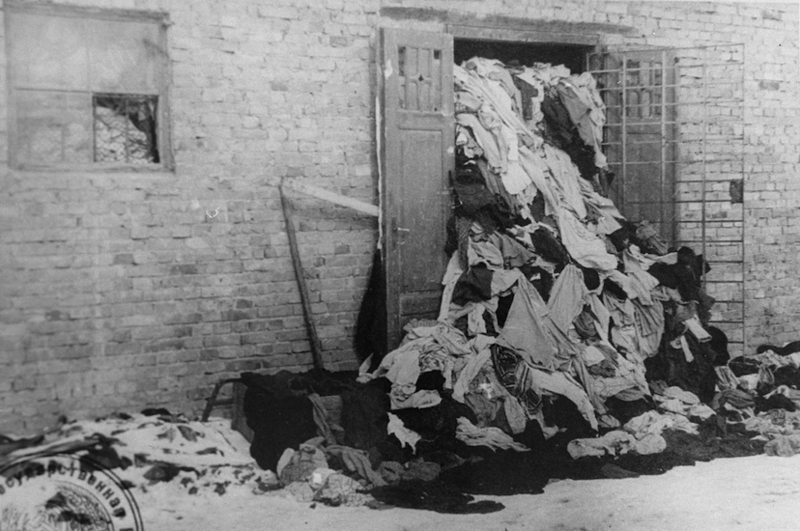 Gerstein asserts that he saw piles of clothes and shoes 45 meters (about 147 feet) high at Treblinka. This is clearly impossible and throws the credibility of the whole Report into question. Gerstein estimated the number of Jews murdered in the gas chambers of the Operation Reinhard camps as 20,000,000 to 25,000,000—an obviously absurd figure. For Holocaust deniers, these inconsistencies mean that Gerstein invented his report to curry favor with his captors, or Gerstein’s Allied interrogators tortured him to confirm their mountain of lies. Let us look at each assertion one at a time. Gerstein did provide two different sets of dimensions for the size of the gas chamber rooms at Belzec. In Reports 1 and 2 he wrote that the gas chamber rooms were 4 meters by 5 meters by 1.9 meters [13 feet by 15.5 feet by 6 feet]. In Report 3, he changed it to 5 meters by 5 meters by 1.9 meters [16.5 feet by 16.5 feet by 6 feet]. Gerstein didn’t say if he entered the actual gas chamber rooms, or whether he accepted someone else’s estimate of their size. However, even if Gerstein had entered the empty rooms or looked into them from the hallway, trying to accurately guess the size of a room can simply produce inaccurate results. Reports 1 and 2 reflected Gerstein’s first thoughts about the size of the rooms. Perhaps the change is a typographical error. It is most likely that Gerstein reconsidered his estimate when typing up Report 3 in German. We do not know, but whatever the reason it’s not a significant issue. This line in Gerstein’s report is puzzling. Gerstein visited Treblinka on August 19, 1942. On August 19, Treblinka was still using the smaller three-room gas chamber. So, why did Gerstein describe the larger gas chamber building, which started construction about 10 days after his visit and did not become operational until about 5 weeks later? Gerstein would undoubtedly have been told the plans for the newer, larger gas chambers. Did he confuse the smaller building he saw with the planned expansion? Whatever the reason for Gerstein’s mix up, it does not negate his otherwise consistent description of the overall gassing process. Charles Provan wondered if that was really possible to push 700 to 800 people into the size of room Gerstein claimed. He decided to test it for himself. He built a plywood box with a base area of 21 inches by 21 inches. The box had one glass side, two plywood sides, one open side and an open top. He was surprised by the results of his experiment. Provan found that two young adults (27 and 34 years old), one woman in her seventies, and four children could fit into the box without difficulty. All of the people wore their regular clothing and all were able to breathe normally. Three children (aged 6, 4 and 2) sat down at the adults’ feet while the older child (8 years old) and the three adults stood. One of the adults held a doll in place of an infant. Provan’s findings, when extended to a room of 5 meters square (about 16 feet square), shows that 700 to 800 people could be pushed into the gas chamber room, especially since, according to Gerstein’s account, half of them were children. In addition, the participants in Provan’s experiment were well-fed Americans, not half-starved, naked Polish Jews. Provan calculated that this variation alone permitted 5 percent more Polish Jews to fit into the same area than their modern well-fed American counterparts. Clearly, Gerstein was not very good at judging the height of these mounds. It is, however, clear that the piles of clothing and possessions were staggeringly high. From his 3rd report, it appears that even Gerstein questioned the estimated height of the mounds from his first figures. Gerstein is the most credible and consistent when he is describing what he actually saw with his own eyes. However, when Gerstein speculates and passes on rumors he had heard, his accuracy drops dramatically. In the case of the number of Jews murdered in the Operation Reinhard camps, Gerstein accepted the figures of Odilo Globocnik, the head of the extermination program, who told him that 11,000 Jews in Belzec, 25,000 Jews in Treblinka, and 20,000 Jews in Sobibor were being murdered every day. We know that this is not true, so it is clear that Globocnik was boasting to the representative from the government in Berlin about his great achievements, probably hoping that Gerstein would return to Berlin filled with praise for his operation. Gerstein also believed that the camps operated for a longer period than they really did. In fact, the mass murder activities in all three camps were largely concluded by the end of 1942 and by mid-1943 the camps most of the bodies had been incinerated, the ashes reburied and the camps razed. The most recent responsible scholarship indicates that some 1,400,000 Jews were murdered in all three camps. Gerstein’s guesses are just that—guesses. They do not rise to the level of evidence nor do they substantially invalidate the details and extent of the murder operations in the three camps. The Gerstein Report is not perfect. He made a lot of small errors and engaged in guesswork, especially when he was relying on the word of others. These errors and speculations do not discredit the entire Report. Gerstein’s testimony was consistent across all versions when it dealt with the description of the camps and the mass gassing. All three reports can be found in translation and in their original form in Henri Roques, The ‘Confessions’ of Kurt Gerstein (Institute for Historical Review, 1989). Report 1 (French, handwritten, dated April 26, 1945): translation, pp. 19-27, original in French, pp. 210-221; Report 2 (French, typed, dated April 26, 1945): translation, pp. 27-36, original in French, pp. 222-228; Report 3 (German, typed, dated May 4, 1945): translation, pp. 73-89, original in German, pp. 229-246. Report 3 (German, typed, May 4, 1945). “One Third of the Holocaust” at http://www.youtube.com/watch?v=taIaG8b2u8I at approximately 3:37 minutes. Provan was concerned that no one would believe him so he took pictures. You may read the study, “Kurt Gerstein and the Capacity of the Gas Chamber at Belzec,” and see the photographs at http://holocaust.skeptik.net/documents/provan_gerstein.html. Samuel Willenberg, Surviving Treblinka, edited by Wladyslaw T. Bartoszewski (Basic Blackwell Ltd, 1989), pp. 49, 79. Jonathan Harrison, Robert Muehlenkamp, Jason Myers, Sergey Romanov and Nicholas Terry, Belzec, Sobibor, Treblinka: Holocaust Denial and Operation Reinhard. A Critique of the Falsehoods of Mattogno, Graf and Kues, p. 382 (fn 1) at http://holocaustcontroversies.blogspot.com/2011/12/belzec-sobibor-treblinka-holocaust.html.